She has been accused of anti-Semitism over comments she made about Israel and pro-Israel lobbyists. After being rebuked last month, including by Democrats, she apologised and said she was "listening and learning". Just last week, police arrested a 55-year-old man in New York state for allegedly calling her office with a graphic death threat in which he reportedly labelled her a "terrorist". After the Washington Post fact-checked the statement to clarify Cair was actually founded in 1994, a spokesman for Ms Omar told the paper that she misspoke and meant to say the organisation's size had doubled after the attacks. 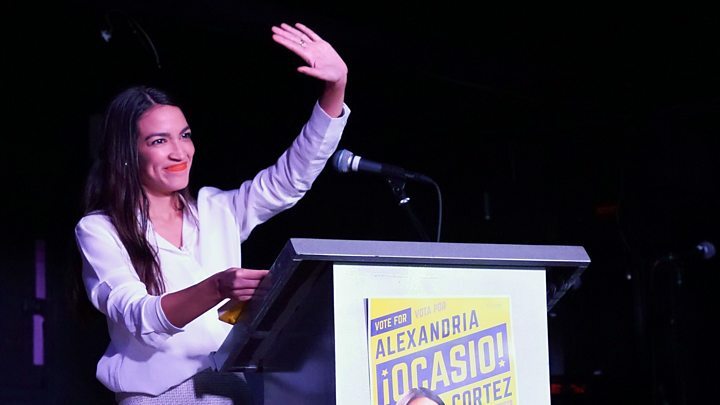 Her speech began getting attention on 9 April, when a clip was shared by Texas Republican Representative Dan Crenshaw, who described her phrasing as "unbelievable". Ronna McDaniel, chair of the Republican National Committee, described the congresswoman as "anti-American". 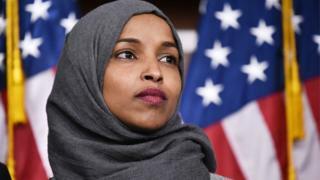 Ms Omar responded by calling some of the comments as "dangerous incitement, given the death threats I face" and comparing her remarks to ones made by former President George Bush. On Thursday, the New York Post published a front-page spread of an image of the attack with the headline: "Here's your something"
One reply to Ms Pelosi, by film director and frequent Trump critic Ava DuVernay, which said Ms Pelosi's comment was "not enough", has been liked thousands of times. Responding directly in a series of tweets on Saturday, the congresswoman thanked people for their support and vowed that she "did not run for Congress to be silent".